You've likely experienced the random, sleep-interrupting pain of muscle cramps. Beat those nocturnal leg cramps with these simple strategies. Taking a vitamin B complex supplement substantially improved nocturnal leg cramps in a group of elderly patients with high blood pressure in a double-blind trial. Up to 60 percent of adults have had nocturnal leg cramps. These recurrent, painful cramps usually strike the calf muscles and can cause frequent awakenings and severe insomnia. They are more common in people aged 50 years and older. If you’ve suffered through them, read on to learn how to lower your risk and get a good night’s sleep. Exactly what causes cramping is unknown, but cramps are probably caused by muscle fatigue, nerve dysfunction, and/or electrolyte abnormalities (chemical imbalances in calcium, potassium, and magnesium). Certain medications, such as those to treat high blood pressure, high cholesterol, or psychiatric disorders. Medications strongly associated with leg cramps include conjugated estrogens, raloxifene (Evista), naproxen (Aleve), and teriparatide (Forteo). Certain medical conditions, including hormone disorders such as thyroid disorders or diabetes; neurological conditions such as Parkinson’s disease; vascular disease; cirrhosis; and lumbar spinal stenosis. When you tell your healthcare practitioner about leg cramps, it’s important that he or she takes a thorough history and physical examination, and orders tests, if necessary, to rule out other conditions that can cause leg pain, such as restless legs syndrome, claudication, myositis, and peripheral neuropathy. Conventional treatment for nocturnal leg cramps uses prescription medications. Quinine used to be the gold standard, but is no longer commonly recommended due to a considerable risk of birth defects and serious adverse effects. Calcium channel blockers and antiepileptics are considered potential alternatives to quinine, but they can have considerable side effects of their own and their effectiveness for cramps has not been extensively studied. A better approach is to try these natural strategies. To stop a calf cramp while it’s happening, stretch the calf by pulling the toes closer to the shin while keeping the knee as straight as possible and simultaneously massaging the calf muscles. Doing this has been shown to help relieve pain quickly during a cramping episode. 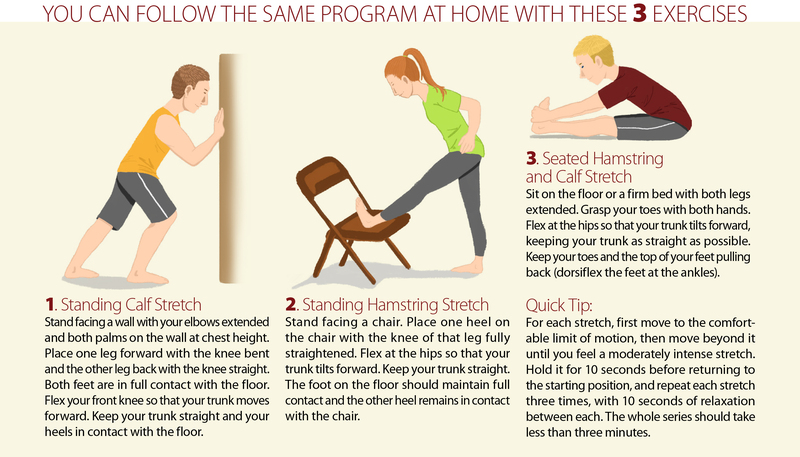 To help prevent nocturnal leg cramps and reduce their frequency and severity, a simple three-minute stretching routine before bed has been found to be helpful. A study in 80 adults found that a six-week long stretching program significantly decreased the frequency and severity of cramps. Magnesium is one of the most commonly recommended natural treatments for muscle cramps. While not many people have serum magnesium levels low enough to be abnormal on standard blood testing, less severe magnesium deficiency and insufficient magnesium status is relatively common. In the United States, around half the population consumes less than the required amount of magnesium. This is likely because of the reliance on heavily processed convenience foods at the expense of the green leafy vegetables, nuts and seeds, and legumes that are among the best food sources of the mineral. Yet, in a double-blind study, 64 patients took either 366 mg per day of magnesium or placebo for four weeks. Seventy-five percent of the patients taking magnesium reported symptomatic improvement. The evidence is particularly strong for magnesium’s effectiveness as a treatment for pregnancy-related nocturnal leg cramps. Given magnesium’s good safety record and its great importance for health, a trial of magnesium supplementation is warranted for anyone with nocturnal leg cramps. Take around 400 mg of elemental magnesium in the form of a chelated magnesium supplement such as magnesium citrate, malate, aspartate, or glycinate. Meanwhile, make sure you’re also eating a nutrient-dense diet containing plenty of magnesium-rich foods, including pumpkin, sesame, and sunflower seeds; black and navy beans; spinach and Swiss chard; and quinoa. You can also take an Epsom salt bath before bed. Pour a couple of cups of Epsom salts into running water and soak with your legs fully immersed for twenty minutes or so. Another safe and natural therapy is supplementation with a vitamin B complex or high dose of vitamin B12 (or both). Taking a vitamin B complex supplement substantially improved nocturnal leg cramps in a group of elderly patients with high blood pressure in a double-blind trial. Patients took one capsule three times per day of either a placebo or a vitamin B-complex containing 250 mcg of vitamin B12 (as hydroxocobalamin), 30 mg of vitamin B6 (as pyridoxal phosphate), 50 mg vitamin B1 (thiamin, as fursultiamine), and 5 mg of vitamin B2 (riboflavin) per capsule. The average pain score decreased in the B-complex group, with almost 30 percent of the group reporting their leg cramps were completely gone and another 57 percent reporting significant improvement. Other published cases and uncontrolled studies have reported that vitamin B12 administered by intramuscular injections or nasal spray can relieve chronic nocturnal leg cramps in elderly people. While these forms of B12 are not available without a prescription, there is evidence that sublingual forms of vitamin B12 can be as effective as injections. If you have no success with a magnesium or a B-complex supplement, try a high dose (2,000 micrograms) of sublingual vitamin B12 (as hydroxycobalamin or methylcobalamin) daily. Limit your consumption of refined, packaged, and processed foods while increasing your consumption of magnesium-rich foods like dark leafy greens. Next, try a regular stretching program during the day and just before going to bed as described above. If these measures don’t relieve your leg cramps, try magnesium as magnesium glycinate, citrate, malate, or aspartate, 400 mg in divided doses throughout the day. At the same time, take a vitamin B-complex supplement three times daily. If you still find no relief, add 2000 micrograms of vitamin B12 under the tongue. Together, these steps can help ease leg cramps so you can get a good night’s sleep. 1. Amer Fam Phys. 2012;86(4):350-355. 2. Consult Pharm. 2008 Feb;23(2):141-56. 5. Nutr Rev. 2012 Mar;70(3):153-64. 6. Family Practice (2014) 31 (1): 7-19. 7. Cochrane Database Syst Rev. 2012 Sep 12;9:CD009402. 9. J Clin Pharmacol. 1998 Dec;38(12):1151-4.
add, b complex supplement, b12, blood pressure, blood pressure high, calcium, calcium channel blockers, cholesterol, cirrhosis, cramping, cramps, cramps at night, dehydration, diabetes, diet, food, health, health news, high blood pressure, high cholesterol, hormone, insomnia 2, leg pain, lumbar spinal stenosis, magnesium, magnesium deficiency, medical conditions, muscle, muscle cramps, nasal spray, natural treatments, natural treatments for, nuts, pain, parkinson s disease, potassium, potassium and magnesium, processed foods, quinoa, relieve pain, severe insomnia, side effects, sleep, spinach, spinal stenosis, supplement, supplements, thyroid, treat high blood pressure, university health news, vascular disease, vegetables, vitamin, vitamin b12, vitamin b6. Very good article. So ACV with honey and hot water won’t help! I was surprised that although potassium was in boldface type at first mention, the article didn’t discuss its use in treatment. I went through a period of frequent bouts of leg cramps, and in reading about them, found potassium deficiency to be frequently mentioned, along with advice to eat more foods containing plenty of potassium. I started eating more bananas and potatoes, drinking more vegetable juices high in potassium (Trader Joe’s “Garden Patch” is one particularly high in potassium), molasses tea (the Wholesome Sweeteners brand of organic molasses is also particularly high in potassium), and other things like orange juice that are less rich in the mineral, but still useful sources. The liquids were helpful to prevent recurrence of cramps when I’d get waked up by them. Eventually I found that my cramps were the result of malnutrition stemming from untreated celiac disease. Once I went on the gluten-free diet and my intestines healed a little, the cramps went away.